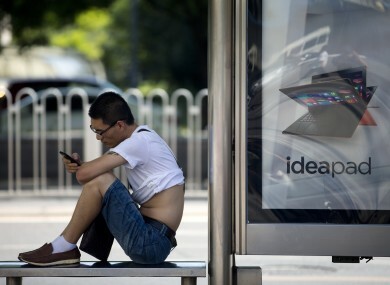 A man checks his smartphone in Beijing. THE GUARDIAN’S WEBSITE has been completely blocked in China, the UK newspaper reported this morning. Citizens cannot access the news site at all, according to a censorship tracker – greatfire.org – used by its reporters. “Numerous attempts to access the site from multiple browsers, devices and locations across Beijing all failed without the aid of firewall-circumventing software,” the Guardian said today. The people behind the tracker believe it is “very unusual for China to block media in English nowadays”. “Besides Guardian, only known examples are NYT and Bloomberg on Xi’s wealth,” they added. It is unclear why the move was taken today or if the block is permanent or just temporary. Over the past two days, no China-related stories have been published online by the Guardian. One article appeared on 6 January which highlighted ethnic tensions in the north-western region Xinjiang. Censorship is a part of everyday life for China’s residents. In November 2013, the Wall Street Journal and Reuters were both blocked. Reporters without Borders has said that the government does not hesitate to “flout freedom of information whenever an embarrassing news item is posted online”. China is on the Reporters Without Borders list of “Enemies of the Internet” and is ranked 173rd out of 179 countries in the Reporters Without Borders press freedom index. Column: Are these the drones we’re looking for? Email “China has blocked its citizens from reading the Guardian”. Feedback on “China has blocked its citizens from reading the Guardian”.